The tag line on the back of the box describes this cereal perfectly... "simply delicious". There's no real surprises here. It's SIMPLY a Chex cereal with lots of DELICIOUS cinnamon flavor. If you like cinnamon and you like Chex cereals, you SIMPLY have to try this DELICIOUS cereal. For flavor and texture, this cereal gets a perfect score. I have to take away one golden egg due to Cinnamon Chex's complete lack (0 grams) of dietary fiber. Even novelty cereals like Hanna Montana Cereal and Star Trek Cereal contain token amounts of dietary fiber (1 gram and 2 grams respectively). Other Nutritional Considerations: Each 3/4 cup serving has 120 calories, 2 grams of total fat (0 grams trans and 0 grams saturated), 25 grams total carbs, 8 grams of sugar and 2 grams of protein. The first three ingredients listed on the side panel are whole grain rice, sugar and corn meal. 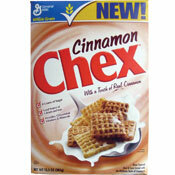 What do you think of Cinnamon Chex? Now it's the gluten-free track and it's still delicious! I'm more of a Cinnamon Life kind of guy, but this is good for anyone with a gluten intolerance who would still like a nice cinnamon flavor. I LOVE all the Chex cereals (specifically Rice), but this one (along with the Chocolate) is the only one that requires NO added sugar for me. Perfect blend of cinnamon and Chex goodness! 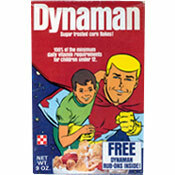 It has to be the best tasting cereal out there, and it is Gluten-free. I find it best dry and used it to replace chips or popcorn during the day. This cereal is one of the best out there. Its absolutely delicious. Perfect in every way.